Room was a little bit smaller than I thought but still perfect for what was needed! They gave us an upgrade!!! Amazing can’t wait to tell our friends family how great staying here was. Stayed 2 nights nice place to stay comfy bed good shower pressure. Lift with trolleys for your stuff so no walking up stairs with your luggage. 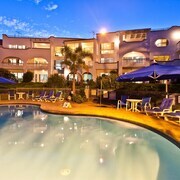 Close to beach and restaurants. Secure garage for parking your car. Only bad thing is we had an ant problem. Couldn't leave anything out or unwashed. Very dirty and smelly room Friendly reception staff and great location. However our one bedroom apartment was very dirty and smelly. I don't think the shower had been cleaned since it was installed! Didn't use the kitchen facilities due to the feel of the room being dirty. Won't go back. The unit was very clean and comfortable. The view was great, across the road from Margate beach. The unit reminded me of beach holidays from childhood. 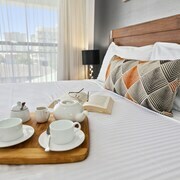 The bed was extremely comfortable and there was all you need to have a relaxed stay. A good and pleasant stay It was everything we wanted. Just an overnight stay and was pleasantly surprised with the standard, ease and the friendly owner welcoming us and presenting a lovely continental breakfast. Definitely no complaints. There’s only one place to go when you want to get hot, wet and…sandy. The beach! There’s a strip of oceanside bliss calling your name, and heeding that call might be the easiest thing you’ve done all year. 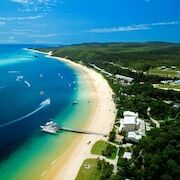 Our beach hotels in Brisbane are here to help you turn off the devices and run on solar power instead. Your seaside escape offers more than just a sweet tan—the refreshing power of salty air and sand between your toes will reveal a whole new you. Find luxurious lodging or a cosy crash pad—you’re sure to spend most of your time on the sand anyway. You can post up in that hammock or cabana all day, but unfortunately, you can’t sleep on the beach. 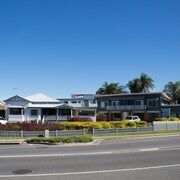 To catch proper Zs, you’ll need Brisbane beach accommodation from lastminute.com.au. Luckily, you can be lulled to sleep by refreshing ocean winds just a few feet from the sand. 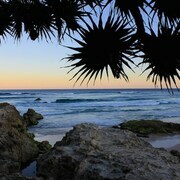 Trade the sounds of the city or suburbs for quietly crashing waves and the occasional slurp of your tropical beverage. After a long day of soaking up vitamin D and playing in the surf, you’ll be glad you did. 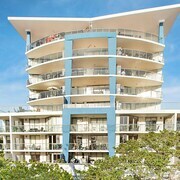 You can catch a breeze and the best deals around with Brisbane beach hotels on lastminute.com.au. Our rates are almost as good-looking as the golden-tanned, beautiful people you’ll see on your beach getaway. 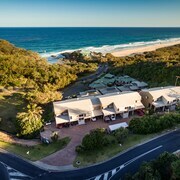 Find the best lodging for your lifestyle, pack your sunnies and get set to take that perfect profile pic: framed by powdery sands and sparkling blue water.